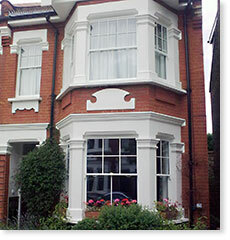 RG Windows Ltd - Traditional Timber Sash Window Specialists, London. This service encompasses the overhauling of existing sashes and box frames. This includes the installation of new beads with integral draught excluders; re-cording with new unbreakable polyester sash cords; rebalancing the sashes and fitting new solid brass/chrome furniture fittings complete with two dual position key operated locks. This will improve both the window’s life and performance - no more rattling or draughts, and better insulation! This service is designed for windows where the original Box-Frame is in good condition and the sashes are in need of attention, or where you have a modern conversion window inserted into original Box-Frame. We will repair and repaint the Box-Frame and if necessary, replace the lower sill with hardwood. We will replace one (made to match the original) or both sashes, single or double glazed depending on your requirements, and also install new beads with integral draught excluders. We will replace cords with new unbreakable polyester sash cords, re-balance the sashes and fit new solid brass (chrome) fittings complete with two dual position key operated locks. This service includes full replacement of the windows and Box-Frame (Master-Frame for casement windows). Windows are manufactured, spray-painted and glazed (Low E, Argon gas filled double glazed units) to comply with Building Regulations. 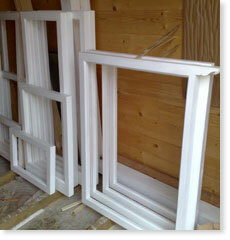 We will copy all original features such as glazing bars or sash horns and replicate them on your new windows. Your fully finished window will be installed by an experienced specialist, to include new beads with integral draught excluders, new unbreakable polyester sash cords, new lead sash balances, new solid brass (chrome) fittings complete with two dual position key operated locks, architraves and nosing, making good, pointing (if required).